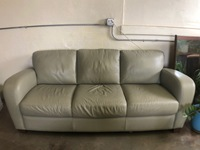 Sage green leather couch for sale in Alpine! Has minor claw damage from cats (see pics), but in otherwise great condition. Super comfy, great for napping and reading. 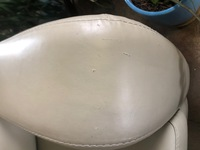 $100 obo. Must pick up as I have no way of moving it myself. Cash or Venmo ONLY! Text 937-887-0849 for more pics or to make an offer!